This page is intended to provide agency IT staff with general comments and instructions for using CARES applications with Internet Explorer 11. 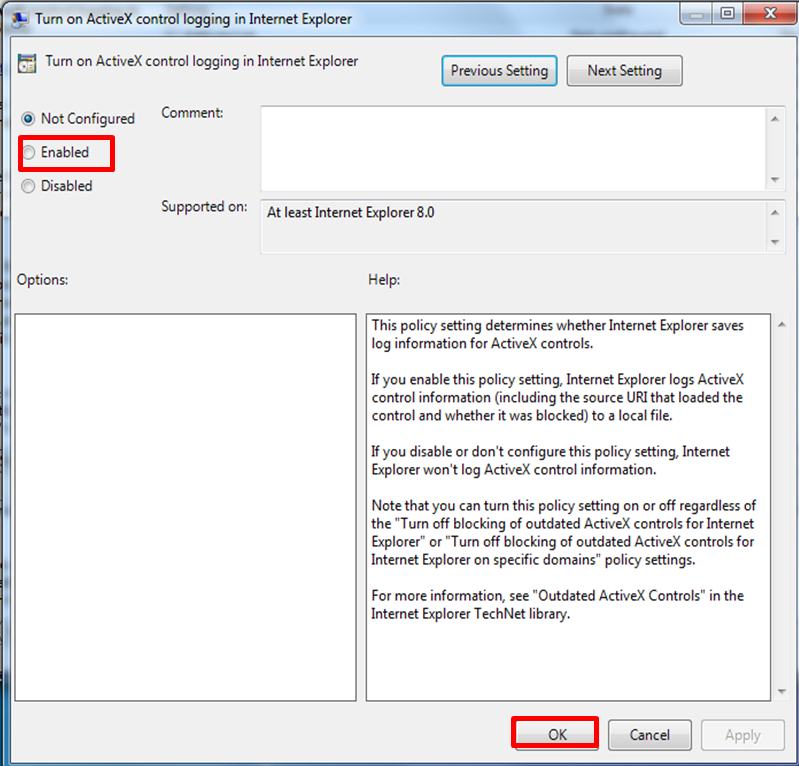 This page includes instructions to disable Enterprise Mode and Compatibility View for CWW while keeping them on for other applications, and instructions for modifying Active X Controls for IE11 so that older Java versions do not inhibit application performance. When Internet Explorer (IE) 11 was introduced, Microsoft recognized that many line-of-business applications were designed around web standards associated with Internet Explorer 8. Since having to redesign all such applications prior to upgrading to IE 11 would be impractical and costly for many enterprises, Microsoft introduced Enterprise Mode to allow for the upgrade while still maintaining needed functionality. Enterprise mode is a high-performance emulation functionality in IE 11. Enterprise Mode is similar to, but different, than Compatibility View. 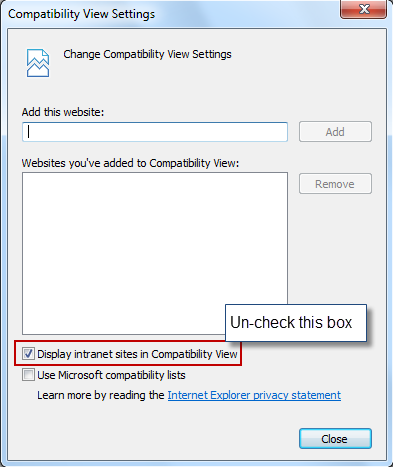 Compatibility View is an emulation functionality present in prior versions of IE and which continues to exist in IE 11. Understandable confusion arises on the roles of IE's Compatibility View and Enterprise Mode with respect to one another (this is compounded by the former often being referred to as "Compatibility Mode"). Though they are both the same type of functionality, they originated at different times and for different, though similar, purposes. Some applications that agencies use continue to require Compatibility View or Enterprise Mode. 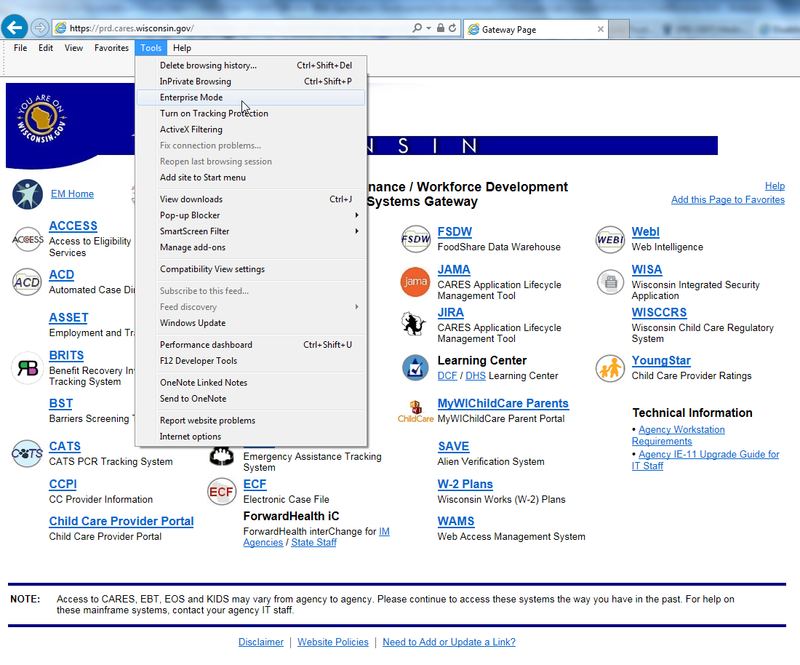 However CARES Worker Web does not function properly with either Compatibility View or Enterprise Mode enabled. Instructions on this page are provided for using these emulators in a targeted, site-specific fashion. Please see the Application Compatibility Chart for a full list of recommended browser/emulation settings for CARES applications. Compatibility View requirements vary between CARES applications. Some applications such as WITS require Compatibility View to be enabled, while others such as CARES Worker Web require Compatibility View to be disabled. Please see the Application Compatibility Chart for a full list of recommended browser/emulation settings for CARES applications. Instructions in this section show how to turn Compatibility View off for the whole domain, and how to turn it on for subdomains. 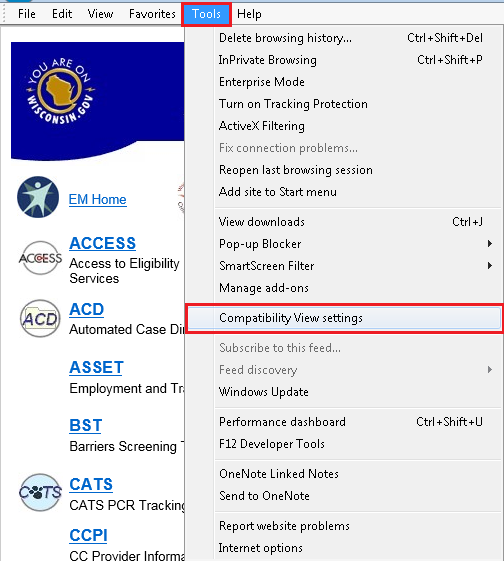 Compatibility View can be turned off both from the Tools menu in the browser and the site list accessible through the Group Policy editor. The ability to adjust the Compatibility View using Group Policy editor is less well-known, and can therefore cause it to remain on when the user believes they've turned it off. 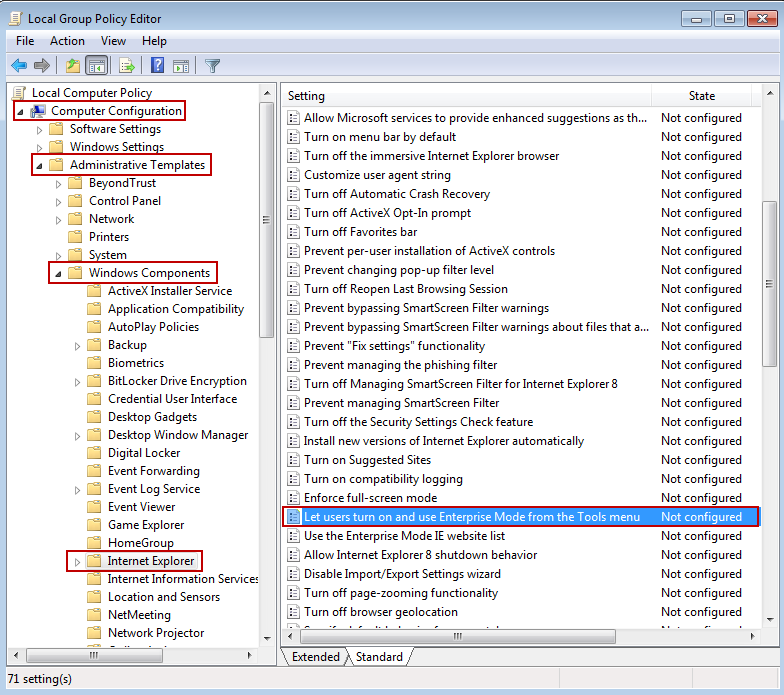 Changes through the Group Policy Editor require access/authority to modify Group Policy Settings on the workstation. Click Tools → Compatibility View settings in IE 11. 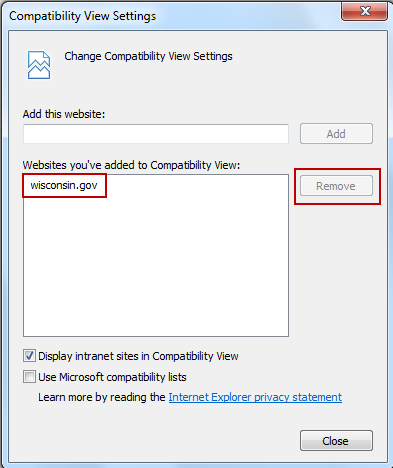 If present, select "wisconsin.gov" from the list of sites and click Remove. If you use CWW on your intranet, un-check the box for Display intranet sites in Compatibility View. Click close and restart IE. Choose path Computer Configuration → Administrative Templates → Windows Components → Internet Explorer → Compatibility View. 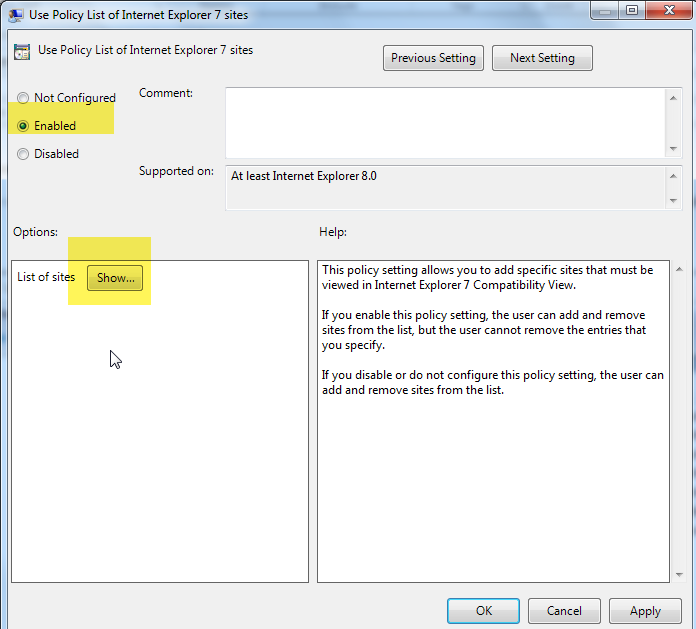 Double click on Use Policy List of Internet Explorer 7 sites. Select Enabled and click Show. 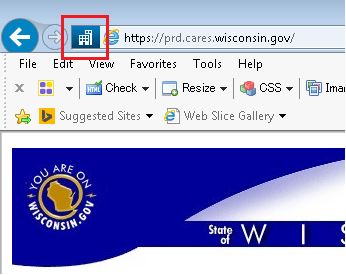 Ensure "wisconsin.gov", "cares.wisconsin.gov", and "prd.cares.wisconsin.gov" are not in the site list. 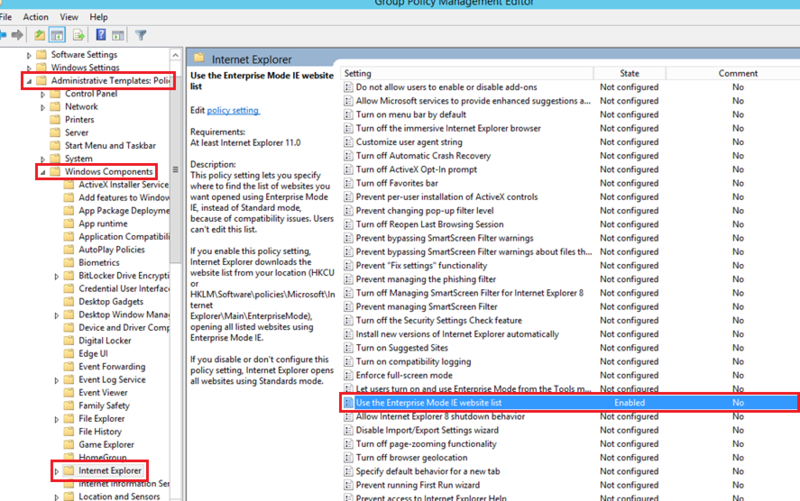 Figure 5 - Sites that should NOT be in the IE7 Site List in Group Policy. 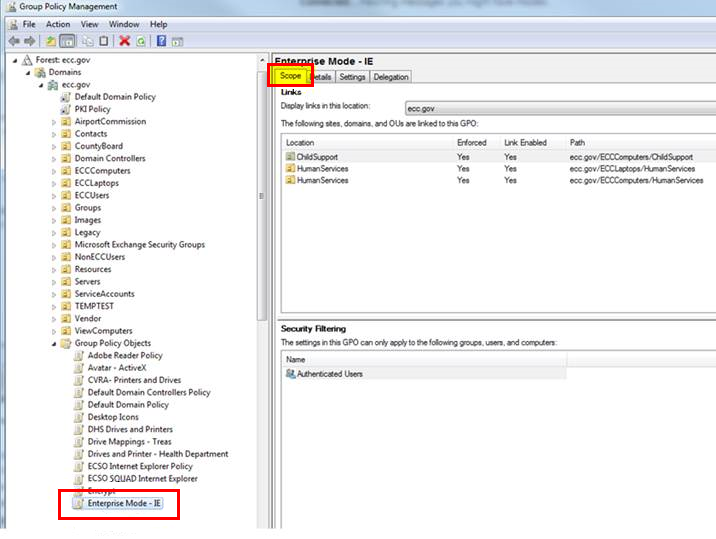 Require access/authority to modify Group Policy Settings on the workstation. 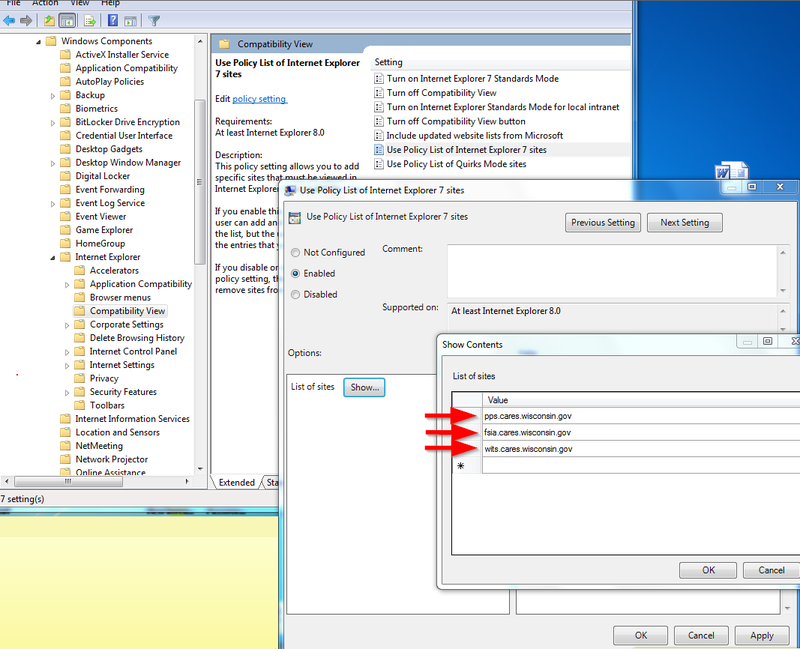 Figure 7 - Enter the subdomains that should open in Internet Explorer 7 mode/Compatibility View. Enterprise Mode requirements vary between CARES applications. Please see the Application Compatibility Chart for a full list of recommended browser/emulation settings for CARES applications. Enterprise mode can be turned off on an individual workstation either from the Tools menu in the browser or the XML "Site List". The Tools menu approach disables Enterprise Mode for all websites, whereas the XML "Site List" approach allows you to target specific application URLs while avoiding others. Requires administrative access to the workstation. Requires use of the Group Policy Editor in Microsoft Windows. With this method, Enterprise Mode can still be toggled 'on' for other applications that might require it. Open the Tools Menu dropdown. (If menu hidden, press alt key). Confirm if there is a check mark next to the Enterprise Mode option. A check mark means that Enterprise Mode is currently engaged. If a checkmark is present, click Enterprise Mode to toggle it off. The check mark will disappear when Enterprise Mode is disabled. With this method, Enterprise Mode is made entirely unavailable to the user for all applications. Note: an XML Site List can still be used to "push down" Enterprise Mode to some or all workstations in an application-specific manner. Choose path Computer Configuration → Administrative Templates → Windows Components → Internet Explorer. 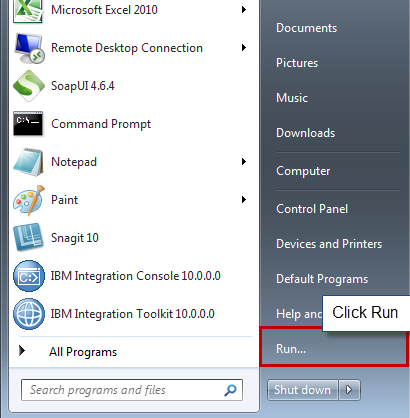 In the right pane, double click Let users turn on and use Enterprise Mode from the Tools menu. Agencies may be able to use the "Site List" functionality that accompanies IE 11's Enterprise Mode to target certain applications/URLs for IE 8 emulation, while leaving others to run in "default" mode. 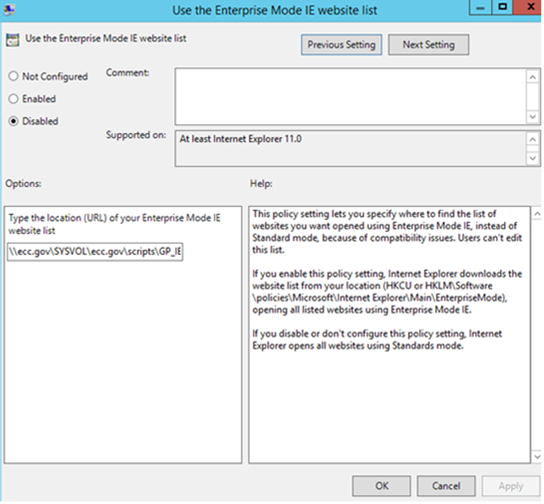 In this case, Enterprise Mode's Site List can either be disabled completely, or modified to allow use of Enterprise Mode for specific applications. These methods assume that Enterprise Mode was implemented using an XML Site list. The most common reason for this implementation is the need to "push down" Enterprise Mode to a set of workstations, rather than modifying each workstation individually. Adjusting the XML Site List directly requires access to the XML Site List itself which is often stored on the domain-controlling server. Choose path Forest → Domains → the specifically targeted domain (e.g. "yourcounty.gov"). Set the relevant Organizational Unit (OU). Any OU below a domain can be right-clicked and edited. 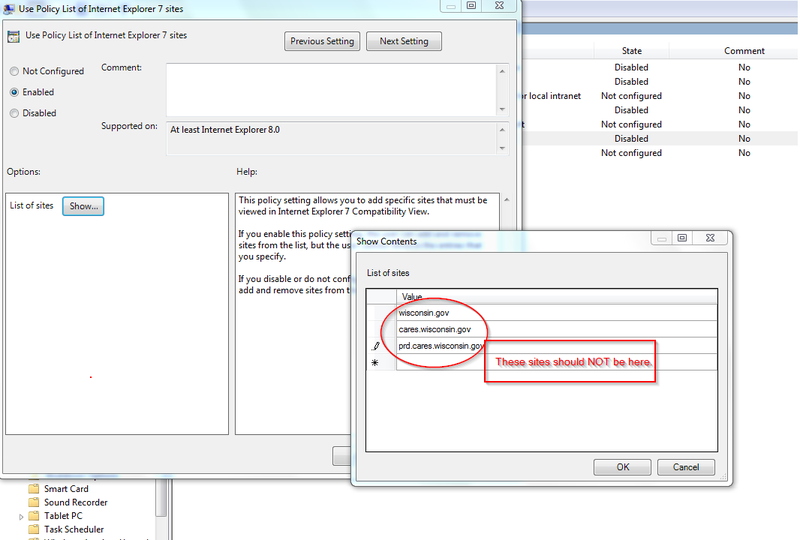 This presents the option to link that OU (or subset of it) to the Group Policy. Figure 11 shows subsets of several OU's ("ECCComputers," "ECCLaptops," etc.) linked to a policy. Expand the Group Policy Objects folder found at the bottom of the OU folder list. 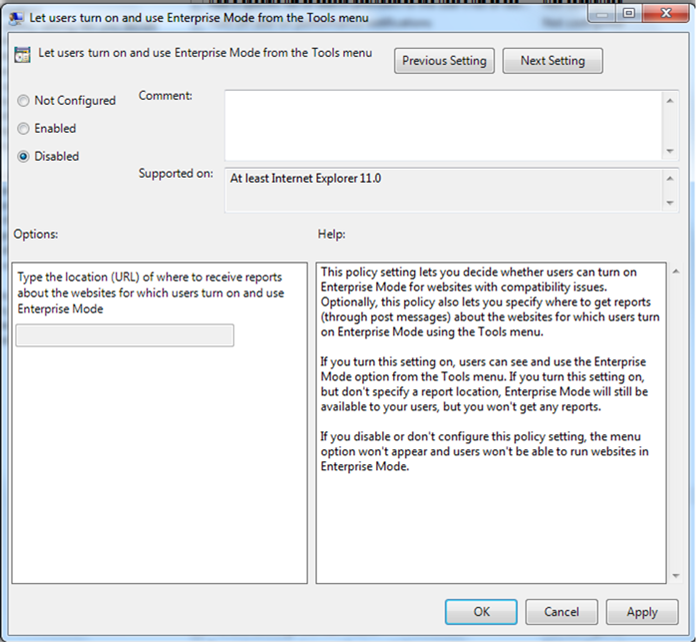 Right click Enterprise Mode - IE, and select Edit to open the Group Policy Management Editor. In the Group Policy Management Editor's left pane expand Administrative Templates → Policies → Windows Components → Internet Explorer. 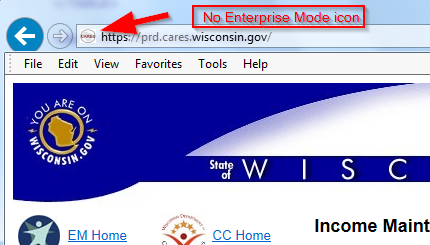 In the right pane double-click Use the Enterprise Mode IE website list. Click Disabled to deactivate the setting. Close the Enterprise Mode Group Policy Management Editor. Return to the Group Policy Management console, and select the Settings tab. Access the XML Site List, wherever it is stored on your system. Locate the "version number" at the top of the XML document, and increment the number up by 1. (E.g. If it was "4", change it to "5"). This is a crucial step. Process will only work if version number is adjusted. In order to increase performance, IE11 will not check for new Site List changes unless it sees that this number has been changed. Save the Site List in the location that you've specified for referencing it. Assuming Enterprise mode was enabled at an individual workstation via the Registry. 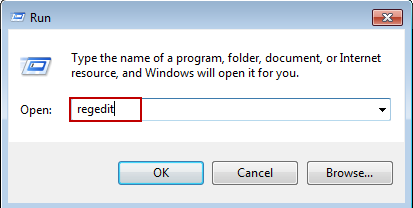 Type "regedit" (without quotes), and then click OK. In left pane, expand HKEY_CURRENT_USER → Software → Policies → Microsoft → Internet Explorer → Main → EnterpriseMode. Close 'regedit' and restart IE 11. 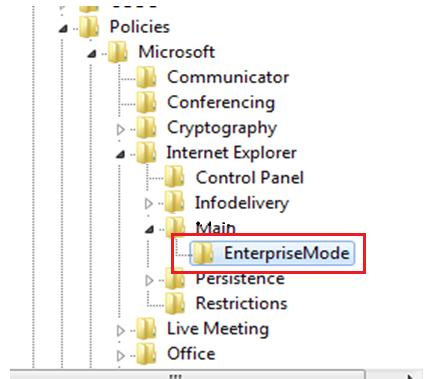 Check for the Enterprise Mode building icon in the address bar. If the building icon is present in the address bar: Enterprise Mode is on. If the building icon is absent in the address bar: Enterprise Mode is off. Active X controls are small apps that facilitate interactive content. However, different/newer Java Runtime Environments (JREs) utilize different security models. The JRE that is packaged with IE 11 (JRE 1.7) is incompatible with several state applications which require JRE 1.6.x. Microsoft has provided a workaround to disable JRE update alerts from 1.7, allowing you to run IE 11 in tandem with JRE 1.6.x, without receiving these stifling security alerts. Requires admin access to the workstation. Choose path Computer Configuration → Administrative Templates → Windows Components → Internet Explorer Security Features → Add-on Management. In the right pane of 'Add-on Management' is the list of 'Settings'. To enable a setting, double click on the setting in the right pane and select Edit. To enable a feature, select Enabled then press OK.
Repeat steps 4-5 for each setting to be enabled. Note: This process does not remove the "Update" button in the out-of-date ActiveX control blocking notification for Internet Explorer. See instructions in Section 4.2 to change this setting. Click Start then type "cmd" in the Search program and files field. 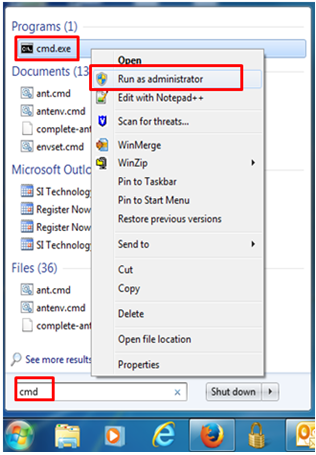 Right click on cmd.exe and select Run as administrator. Type the following commands and press Enter after each to automatically turn on the setting. Microsoft. Internet Explorer begins blocking out-of-date ActiveX controls. Group Policy and Active Directory Domain Services. Microsoft. Stay up-to-date with Internet Explorer. Oracle. New Deployment Policies for Java SE Customers.